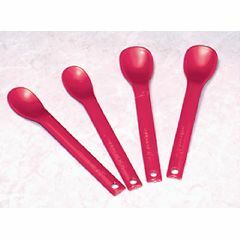 Maroon Spoons are sturdy plastic spoons with narrow, shallow bowls to allow food to slide off easily. These work well with children who need to be fed or are beginning self-feeding but have poor lip closure, oral hypersensitivity, or tongue thrust. Especially useful for assessment or when starting on solid food, since the amount of food can easily be limited. Two sizes of bowls fit a variety of needs. Small bowls holds slightly less than ½ teaspoon, larger bowl slightly more. Durable plastic stands up against reflex biting. Sold in packs of 10. Will not hurt when bitten. Special needs mom.. Special needs mom.. These are indispensible for feeding my total care child. He cannot break them or his teeth when he bites down and they are comfortable to use. Maroon Spoons: do they melt in industrials dishwashers?